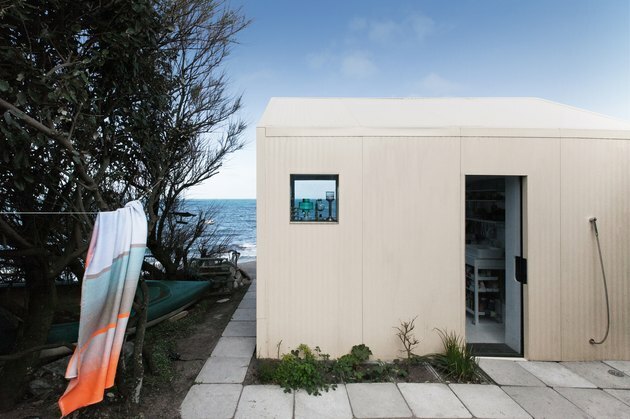 When refurbishing a 1950s concrete fishing shack on the coast of Normandy, France, architects Yves Pasquet, Cyril Gauthier, and Guillaume Aubry of Paris-based firm Freaks Architecture took inspiration from an unlikely source: Henry David Thoreau. The home, which is nicknamed The Viking Seaside Summer House (because the area is historically known for its Viking invaders), is the exact dimension of Thoreau's cabin at Walden Pond, 10-feet-by-15-feet. Because of French construction regulations, the space had to stay small. The architects weren't able to change the size or shape of the home, so they worked to optimize what was there. The exterior is now clad in champagne-colored galvanized metal, which contrasts with the rocky coastline. 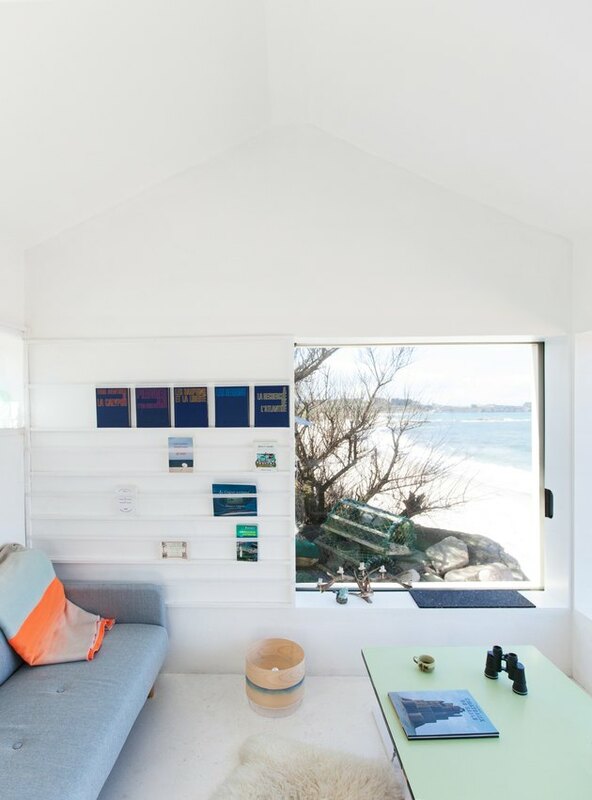 Two large sliding windows brighten up the interior and offer views of the sand and surf. They kept the interiors minimal (although not quite as minimal as Thoreau) with an open kitchen and lounge area. 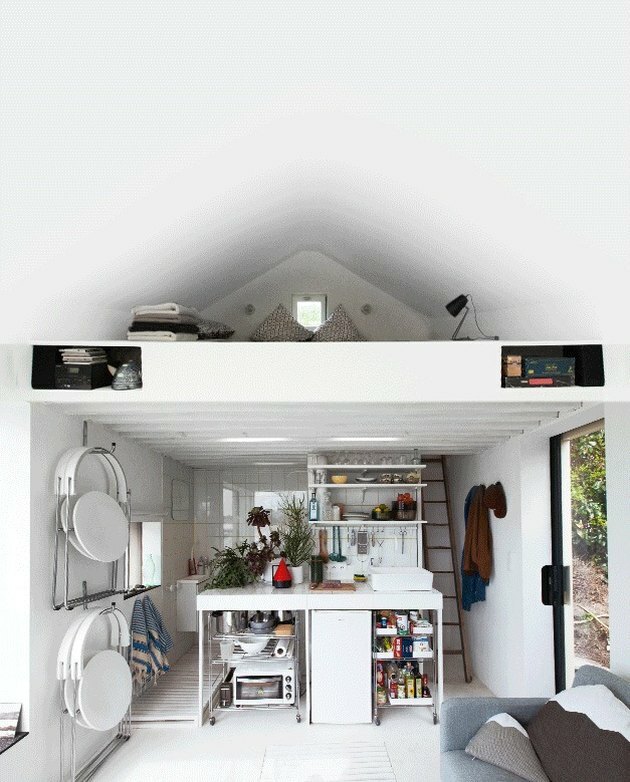 A simple ladder leads to a mezzanine sleeping area. The finished space is serene and focused on the natural beauty of the setting. 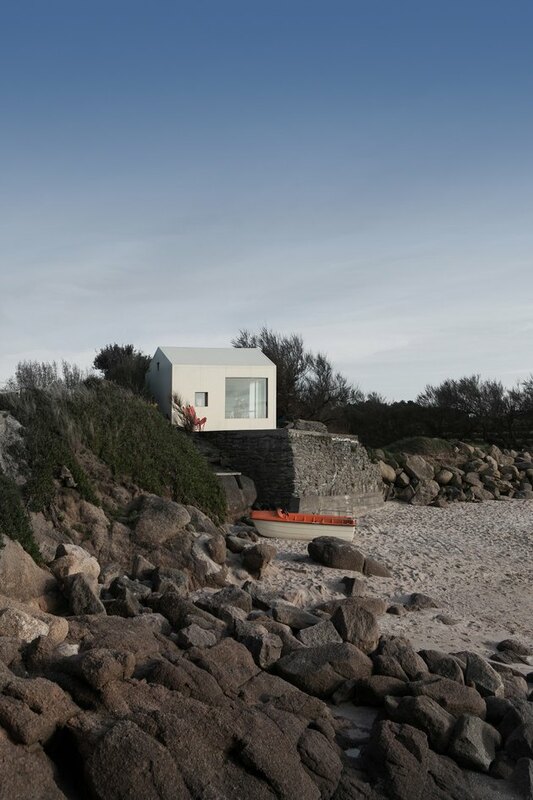 The concrete shack, which is set on a rock above the beach, was revived with new roofing and sleek exterior cladding. 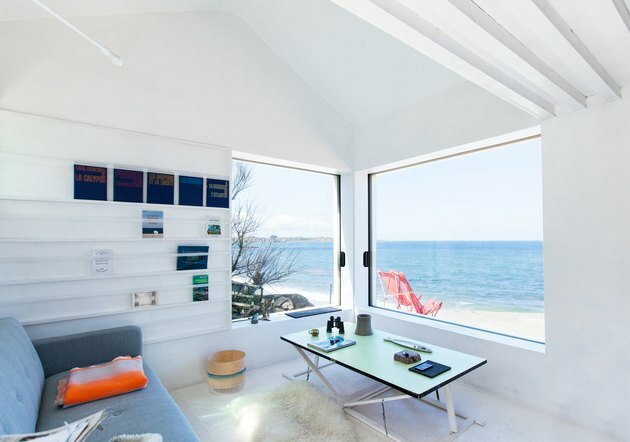 The two large windows slide open to bring in ocean breezes. The walls, ceiling, and floor were all painted a bright white. The living room was simply furnished with a modern sofa and table. Folding chairs, which hang on an adjacent wall, can be opened for more seating. Yellow grout adds a sunny touch in the kitchen and bathroom. 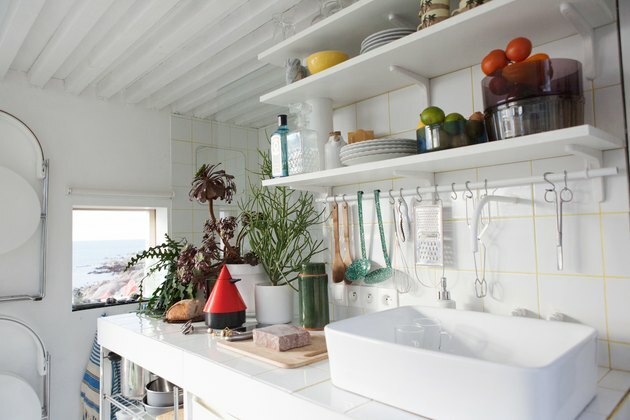 All the kitchen essentials were incorporated into one wall, which is open to the living room. Additional storage was incorporated into the floor of the mezzanine sleeping area. The bathroom is located behind the kitchen. 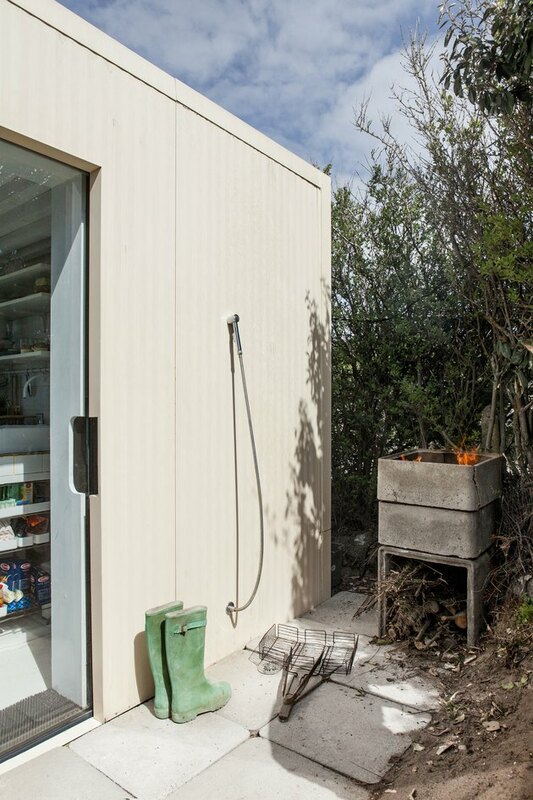 A spare corner by the entrance was made into a functional space with a grill and an outdoor shower. 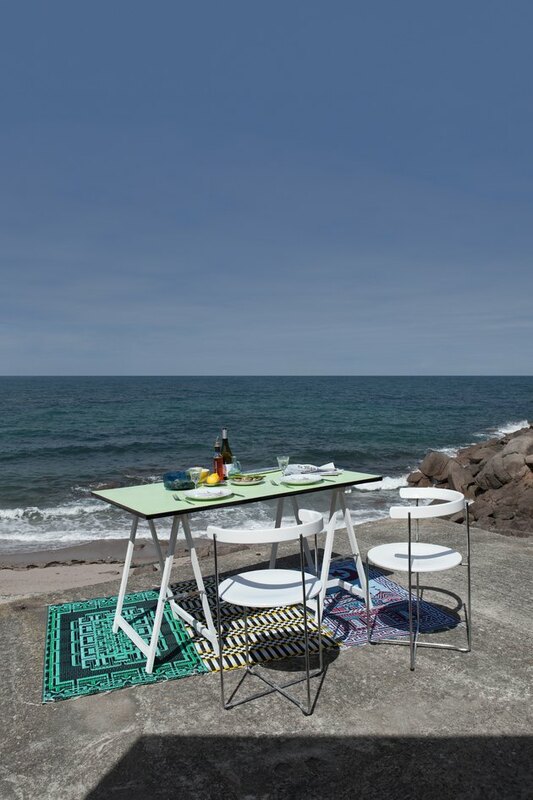 Valdimar Harðarson folding chairs and a trestle table help turn the large terrace area into an extension of the living space.